Bright young number crunchers from primary schools around Leeds got together this week to multiply their maths skills at a summer camp run by The Grammar School at Leeds (GSAL). 36 pupils from 14 schools attended the three-day camp, which extended their maths knowledge to a level beyond their school year in an interactive way appropriate for the age group. The pupils, from years 4 and 5, were selected for the camp on the basis of their exceptional ability in maths. 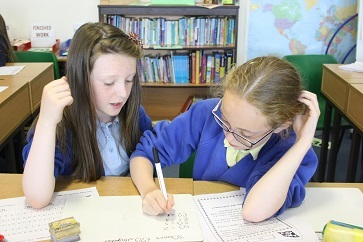 The children spent two days at GSAL Junior School, working together on fun maths games and activities designed to develop their problem-solving skills and teamwork. The third day was spent at the University of Leeds, where the children did a maths-themed campus trail and experienced their first university lecture. The programme was devised and led by GSAL Junior School teacher James Shepherd together with colleagues from the White Rose Maths Hub based at Trinity Academy, Halifax. The summer camp is supported by the Department for Education’s (DfE) Independent State School Partnership (ISSP) primary curriculum project. GSAL was one of a number of schools that successfully bid for funding by submitting proposals for cross-sector projects to strengthen the teaching of subjects in Key Stage 1 and 2. Other primary schools taking part in the camp were Rawdon St Peter’s C of E Primary School, West End Primary in Horsforth, Beeston Hill St Luke’s, Carr Manor, Kerr Mackie, Gledhow, Allerton, Brodetsky, St Peter’s C of E and Brownhill primary schools in Leeds, Fountain Primary School in Morley, Crossley Fields Junior and Infant School in Mirfield and Harewood Primary School.